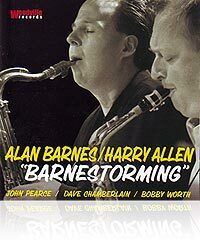 When I first heard Harry Allen in the late 80's I knew he was the genuine article, the real thing- a jazz musician through and through. I heard Harry many times in the following years but really got to know him better in 2000 when we were touring the U.S.A. as part of a swing show under the leadership of Warren Vache. 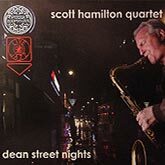 I jumped at the suggestion we record together when Harry was over doing a few nights at Ronnie Scott's. With John Pearce and the trio, the session went without a hitch of any kind. Barnestorming shows two strong soloists doing what they do, and doing it particularly well. Both of them possess immaculate tones, while their phrasing is such that aficionados can probably spot them at a hundred paces across a crowded hall. 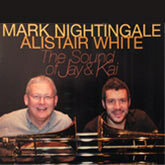 Two saxophonists with a lot in common, including inventiveness, mischievous humour and a born talent for swing. They make it sound easy but some of the playing is hair-raising, both from the imaginative and technical points of view. Add to this the unflappable John Pearce on piano, bassist Dave Chamberlain and drummer Bobby Worth and you have the perfect recipe.